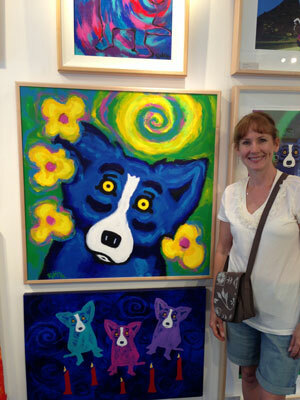 George Rodrigue’s Blue Dog painting at Rodrigue Studio in Carmel, California. On a recent trip to Carmel-by-the-Sea, California, I found the art gallery Rodrigue Studio gallery, exclusively of the work of George Rodrigue. Known primarily for his ‘Blue Dog’ paintings (oil, acrylic, watercolors; also drawings and mixed media) and limited edition prints (lithography, silkscreen, and serigraph), the George Rodrigue web site has a timeline, indicating that the first Blue Dog was painted in 1984, but prior to that the artist originally painted Cajun culture-themed works and Louisiana landscapes. Initially, he used a photograph of his own deceased dog as reference, and since then, sometimes incorporates figures and landscapes with the dogs into the work. Early blue dog paintings were not yet called Blue Dog until they became more popular in the early 1990s. 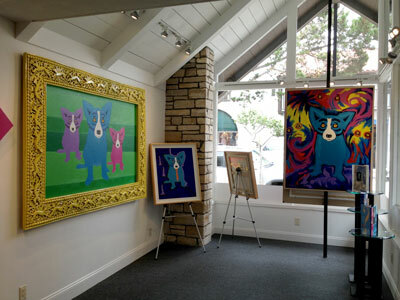 George Rodrigue’s Blue Dog mixed media artwork at Rodrigue Studio in Carmel, California. Where else do you expect to see a painting of Clint Eastwood but in Carmel, California, at the Rodrigue Studio, in the city where he used to be mayor? 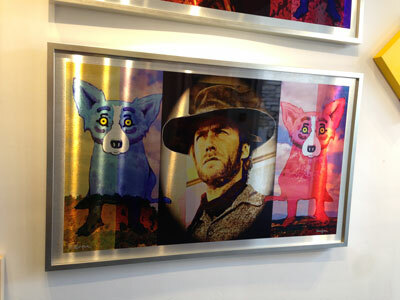 Believed to be from his 2013 Hollywood Stars series, it is done in archival ink on metal, at 41 x 62 inches. The gallery representative was friendly and outgoing, and allowed me to enjoy the whimsical work without pressure, making the experience fun and memorable – even allowing me to take photographs and offering to take one of me next to a painting. Blue Dog books that have sold by the hundreds of thousands, calendars, and notecards are available on Amazon.com. 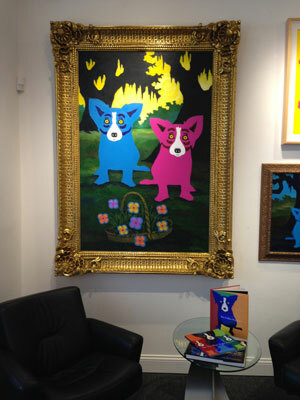 George Rodrigue Blue Dog painting. What is the attraction to these paintings? They are unique and spark the imagination. Rodrigue painting reap high prices. Two sold recently at New Orleans Auction Galleries, Inc. – the 36″ x 48″ oil on canvas “My Yellow Oak” had a hammer price of $80,000, and the 14″ x 18″ acrylic on canvas “Blue Dog and Cypress” had a hammer price of $22,000, which doesn’t include the 23% buyer’s premium. Aside from inquiring about these works directly from Rodrigue Studio galleries (Carmel, CA, Lafayette, LA, and New Orleans, LA) and possibly at other art galleries, they are available on upcoming auctions at Liveauctioneers.com. Additionally, I found several of his paintings and prints for sale at Artbrokerage.com. Next time I am in Layfatte, I would like to sit and eat Cajun cuisine at Blue Dog Café, which George has visited, surrounded by walls of a private collection of Blue Dog Art! 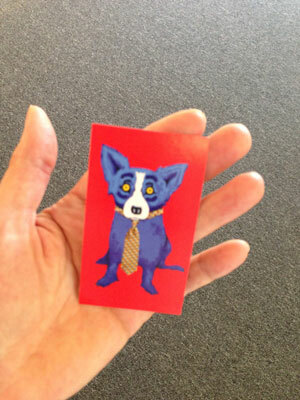 Business card from Rodrigue Studio, Carmel, CA. You are currently browsing the Janet Dodrill's Blog blog archives for July, 2013.